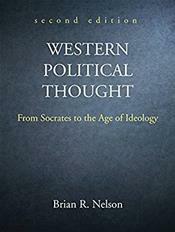 Written simply and directly but without sacrificing intellectual depth this widely acclaimed text explores the preeminent theorists of Western political thought from the pre-Socratics to the contemporary era. The author provides an in-depth analysis of a limited number of major thinkers, which allows for a richly detailed examination of each philosopher in historical context. Western Political Thought, Second Edition, presents the fundamental terms, ideas, and dilemmas of Western political philosophy in a straightforward, easy-to-understand manner. It organizes the theorists historically, explains basic concepts in depth, and draws out and analyzes the implications of various political theories. Moreover, this cohesive volume employs an overarching theme, examining each thinker in terms of the changing relationships of ethics and politics in Western political philosophy. Not-for-sale instructor's materials available online to college and university faculty only; contact publisher directly.